Icon Wheelchairs founder Christian Bagg has tested many versions of his powerful Explore model on The Great Trail’s West Bragg Creek routes, in Alberta. All of a sudden one day in 1996, Christian Bagg could no longer snowboard, mountain bike or hike the backcountry he loved so much. A snowboarding accident broke the young Albertan’s back, but he was soon using skills acquired as an apprentice machinist at the University of Calgary to build a wheelchair that actually fit his 6'5" frame. He started designing better equipment for medical tech companies, and by 2010, had founded Icon Wheelchairs with 13-time Paralympic medallist Jeff Adams. Frustrated by attempts to navigate narrow backcountry routes in a sit-ski, Bagg started channelling his innovation into returning to the trails — and to do so at the same level as before. 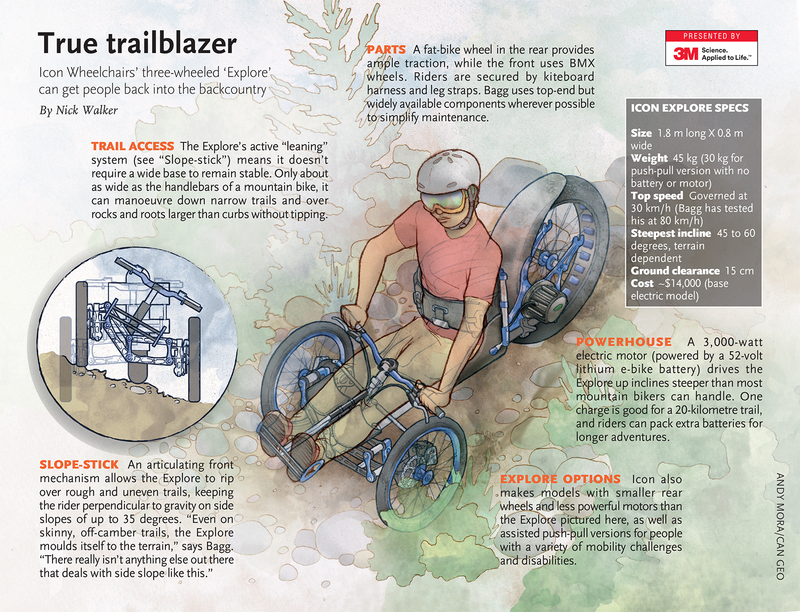 About six years and 16 major design evolutions later (many tested around The Great Trail’s West Bragg Creek routes), Bagg arrived at the Explore model illustrated here, an agile electric machine on which he can keep up with and even outpace experienced mountain bikers. Teachers! Bring this science innovation into your classroom.